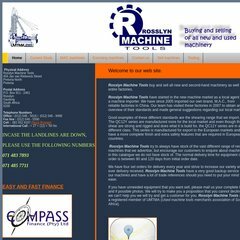 Topics: Used Machines, Saxon Machines, Sell Machines, Tooling, and Hmp Swaging Machines. Its 3 nameservers are ns1.host-h.net, ns2.host-h.net, and ns1.dns-h.com. Owner Het001 Cape Town is the location of the Apache/2 server. Its IP Number is 196.7.147.5. PING www. (196.7.147.5) 56(84) bytes of data. A ping speed test response, is timed at 270 ms.